Walter Leaman lost his courageous battle with pancreatic cancer on October 27, 2006. Walter Leaman was diagnosed in August 2002, at the age of 59, with Stage IV inoperable adenocarcinoma . His prognosis was approximately 6-8 weeks to live. Treatment was clinical trial chemotherapies: Gemzar/Cisplatin; later Gemzar/Oxaliplatin. Care was received at the University of California at San Francisco, which has an NCI-designated Comprehensive Cancer Center. His oncologist was department head Dr. Margaret Tempero. Walter’s primary caregiver, his wife Jean Leaman, also contributed to this story. 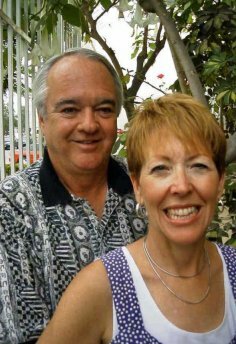 Walter and Jean live in Danville, California, about 30 miles east of San Francisco, where they own and operate a family business. They have three grown children, one of whom – along with her husband and a grandchild – lived with them during the period of this diagnosis and treatment. In the spring of 2002, stomach problems first sent Walter to their long-time general practitioner. The next four months were spent pursuing the prevailing theory of a developing ulcer. At that point, a second consult with GP Dr. Lowell Kleinman led to an endoscopy and biopsy. When those were negative, he ultimately recommending exploratory surgery to ascertain the precise problem. The surgeon was a highly rated one, although not a pancreatic cancer specialist. The morning after the surgery, he arrived in Walter’s hospital room, in near-dawn-darkness, to announce: “We were hoping we would find lymphoma, but we didn’t. I’m so sorry to tell you that you have Stage IV pancreatic cancer. It has spread to your stomach and your liver, there is some lymph node involvement, and I’m so sorry there’s nothing we can do for you.” Then, with tears in his eyes, he left Walter – quite literally – in the dark. The laparoscopic surgery had indicated a large mass protruding from the body of the pancreas and adhering to the posterior wall of the stomach. Lesions, also biopsied as malignant, were present in the liver as well. In a separate conversation with Jean, the surgeon predicted that her husband probably had about six to eight weeks to live. Both describe the next couple of weeks as a surreal transition stage – “a grieving process”. But as with many couples, they differed in their overall reactions to the news. Asked for a word to describe his feeling then, Walter says “resignation”. Jean says “fighting-back”. Walter started writing down instructions for cleaning the pool filter. Jean started shopping for hope. Next stop was the San Ramon Regional Medical Center, where they met with head oncologist Dr. Peter Wong. The Leamans’ goal by then was modest – to get a firmer prognosis on the number of weeks left. To their surprise, Dr. Wong had a different goal. “I want to have Walter back playing golf within a year.” It was the first positive thing either had heard since this dire diagnosis, and tears – and possibilities – began to flow. Dr. Wong was aware of some clinical trials being conducted by a colleague, Dr. Margaret Tempero, head of oncology at the University of California San Francisco (and member of Pancreatica.org’s Science Board). “If anyone can help you, she can,” said Dr. Wong. Fortuitously, a particularly promising trial was about to start. It involved two drugs now common in cancer treatment: Gemzar and Cisplatin. And as the life-giving chemo began, Walter started feeling some hope for the first time. But most friends and family, knowing little about this disease and all of it bad, were (despite best intentions) not exactly surrounding them with encouragement. By the time the trial began, Walter was in serious back and stomach pain and had lost a total of 50 pounds. “It was no surprise to anyone who saw me that I was very near death.” They know many of their friends were feeling they were in denial. Even three years out, “some probably still do”. By the end of the first three weeks, nausea, smell-sensitivity and balance problems had entered the picture. But Walter’s pain and other symptoms were subsiding, eating was getting easier, and the positive vibes were increasing. In communicating about Walter’s situation with their young grandchildren – especially the one that lived with them – they kept it simple. Grandpa’s sick, and we’re all trying to help him get better. “Cancer Free!” In January 2004, 16 months after the terminal diagnosis, Walter and Jean heard the words they never expected to hear. That was the good news. The bad news was that, as often happens, the relentless impact of the Cisplatin had seriously affected his kidneys. The prospect of dialysis loomed, and Walter had a dilemma. He was in uncharted territory – the chemo regimen was keeping him alive, but what would happen when it stopped? Doctors advised him that, at this point, the kidneys were more likely to kill him than the original problem. So, chemotherapy ceased and bimonthly CT scans continued. 15 months passed. Then in the spring of 2005 a tumor reappeared, this time on Walter’s adrenal gland. Dr. Tempero resumed treatment, this time pairing Gemzar with Oxaliplatin, another now-common cancer drug then in trials. Incredibly, the tumor again responded. By the fall of 2005, it was gone again – with no further recurrence so far. So Walter remains in watch-and-see mode, with CT scans continuing every 60 days. “By now, I glow in the dark,” he says. But two side effects are with him as well. First, a new but not-uncommon one, peripheral neuropathy – an ongoing numbness in the fingers and toes. Second, the damage to the kidneys makes it dangerous to use the standard “IV Contrast” which helps to provide clear readings on the all-important CT scans. So while they think things look good, it’s difficult to be sure… A nephrologist is now stabilizing the Creatinin levels, and is recommending the use of a “kidney coating” medication (Mucomyst) that may permit the full (contrast-enabled) CT scans to resume. Online sites most used included: WebMD.com; UCSF.edu; Pancreatica.org; PanCan.org; and the searchable listserv archives at CancerCare.org. Activity-wise, Walter did get fully back to his golf game, and spends a great deal of time organizing tournaments for himself and about 40 other business owners and friends in the Bay Area. His other interests seem to revolve around like-minded others. He volunteers. He talks with people across the country who are in his situation. He also makes himself available for seminars and conferences, either on panels or in what-works workshops with other survivors. Advice for patients and caregivers alike comes in the form of this cautionary tale. In this current stage of CT scanning problems, Walter’s medical files have been prominently marked “DO NOT USE CONTRAST – POTENTIAL KIDNEY FAILURE.” Once, very recently, after the IV was inserted and he was lying horizontal about to enter the tunnel, Walter said “just making sure – you’re not using contrast in that IV, are you?” They were. And everyone was thankful that he spoke up. Medical professionals are still human. Don’t assume – protect your own self. Friends have been a godsend to this couple. Especially so are those who, knowing that it’s not over till it’s over, keep the offers coming even after months, even years, have passed.